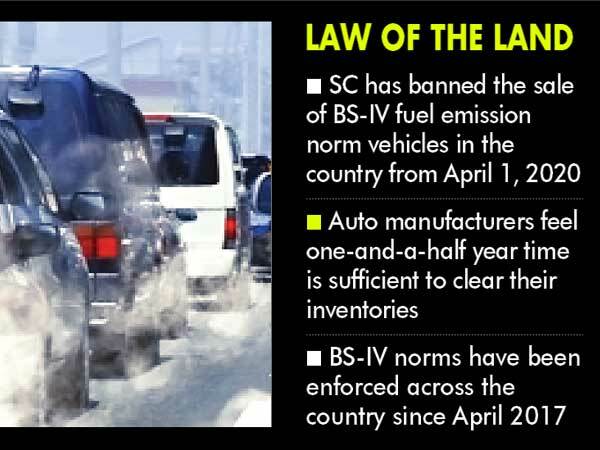 Most automobile manufacturers have committed to be compliant with the Supreme Court order banning sale of Bharat Stage IV or BS-IV fuel emission norm vehicles in the country from April 1, 2020. They feel one-and-a-half year time is sufficient to clear their inventories. BS emission norms are standards instituted by the government to regulate output of air pollutants from motor vehicles. The BS-IV norms have been enforced across the country since April 2017.
over one-and-a-half-year to gear up to meet the challenges. “All our cars which will be launched will be BS-VI compliant and we will have no BS-IV car inventories to worry about,” Bhargava said, adding that each automaker would have to take a call to get rid of the inventories before the deadline. He also said that the order was applicable to all categories of vehicles such as two-three-and-four wheelers. “The order is applicable to both passenger and commercial vehicles,” Raja said. “The OEMs in the country will have no problem in complying to this order,” Subrata Ray, group head, corporate sector ratings at Icra, said. He said only the commercial vehicle segment in the country would be impacted but there was sufficient time to get rid of the inventories. Sridhar V, auto analyst and partner at Grant Thornton India LLP, said the order reflected the seriousness with which environment pollution is xpected to be tackled without loosening the grip and the momentum behind the intention to leapfrog from BS-IV to BS-VI. “In my view, sufficient time has been given to manufacturers of vehicles and I understand most of them are on target to introduce BS-VI compliant engines,” he said. The government has also made its first steps in bringing BS VI grade fuel available much ahead of the deadline in Delhi and it is a matter of making them available across India in the next 18 months or so, Sridhar said. Noting that India has the “dubious distinction” of having 15 out of the 20 most polluted cities in the world, the court said the effect of pollution on the environment and health was so huge that it cannot be compensated in the marginal extra profits that manufacturers might make.